Brrr, it’s cold out there! It’s time to fire up that heat to keep the chill out of your home. But with so many different heating systems available to heat your home, how do you know which one’s the best for you? Here’s how: you read the Quality Bath blog! We’ve created a clear list of the three most popular types of heating systems to help you understand your options. Whether you’re building a new home or upgrading your heat, this guide will help you through it. A forced air system is the most commonly found heating system. This is the standard vented system that you probably associate with “turn on the heat” – vents, ducts, and warmer pockets of air near the vents. Baseboard heating consists of individual units installed along – you guessed it! – the baseboards of the room(s) you wish to heat. They’re essentially the newer version of the old wall-mounted steam radiators. 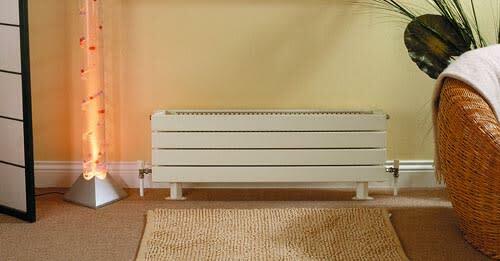 Baseboard heaters can be electric or hydronic (powered by hot water). Energy-efficient; turn it off when you’re out of the room! Radiant systems provides heat via panels and pipes installed under the floors, in the walls, or even in the ceilings. These systems may run on electricity or hot water (hydronic); electric systems are best for small spaces, such as bathrooms, rather than whole homes. Radiant heat is not recommended for homes with poor energy efficiency (as the heat will seep out) or, conversely, excellent energy efficiency (as the costly system will not “pay for itself” quickly). What kind of heating system do you have? Love it or hate it?